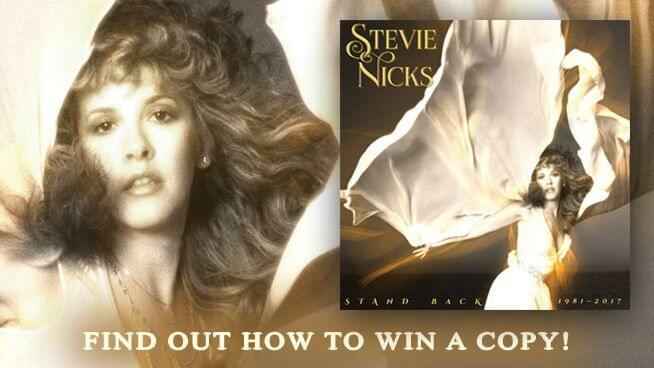 Enter for a chance to win one (1) 18-track single CD of Stevie Nicks: “Stand Back”! Furnished by Rhino. Contest ends 6/15/19 @ 11:59m. One (1) entry per person. One (1) winner will be awarded. Retail value: $14.98. Stevie Nicks: “Stand Back” spanning collections outlining Nicks’ entire solo catalog! Available now on CD, LP vinyl and digital versions. Stevie Nicks makes history when the beloved singer songwriter becomes the first female artist inducted into the Rock and Roll Hall of Fame twice! First as a member of Fleetwood Mac in 1998, and again this year for an extraordinary solo career that spans nearly 40 years. To honor Nicks’ groundbreaking achievement, Rhino has assembled a variety of new releases that celebrate her solo career with essential recordings chosen from studio albums, live performances, and soundtrack contributions, plus several of her most celebrated collaborations with artists including Tom Petty & The Heartbreakers, Don Henley, Lana Del Rey, and Lady Antebellum. “Stand Back” is available NOW! Find more info here. ﻿Your browser does not support iframes. Please visit http://1077thebone.listenernetwork.com/Contest/3XUTYE.